Emma Donoghue’s latest novel thrusts us back into a small, claustrophobic room. Inside is a child, and once again, the child’s life is in danger. An intense drama unfolds. You are never sure how it will end. On the surface, The Wonder displays numerous similarities with Room, the Irish-Canadian Donoghue’s most famous novel. But in Room, we know who the villain is: a sexual predator who has kidnapped a young woman, fathered a son with her, and keeps the two of them imprisoned for years in one tiny cell. The storyline of The Wonder is far more tangled and nuanced. Most characters cannot be trusted; even God is suspect. Donoghue’s literary prowess creeps like a dark, menacing fog across the pages. We are told that an 11-year-old girl, Anna O’Donnell, who has confined herself to a cramped bedroom in her impoverished parents’ home in 1850s rural Ireland, has not eaten for four months. Why is she doing this? How has she survived? Will she die? Cheerful, pious, and clever, the child is apparently fasting voluntarily, influenced by religious zeal and her elder brother’s recent death. Suspicions abound, however, as the result of possibly devious actions by others: her parents, a priest, a nun, and a physician. The Wonder is, above all, a complex and spellbinding tale of good versus evil in which we do not know, until the end, who is really on which side. Told in crisp, cinematic prose, the story opens on Lib Wright, a nurse who served with Florence Nightingale in the Crimean War. Lib is travelling from England to Ireland to share, with a local Irish nun, the responsibility of watching over Anna ceaselessly for two weeks. The two women are to determine if the child has truly stopped eating altogether, as her family claims, or if she is surreptitiously scrounging food to keep herself alive. The committee of prominent town citizens who employ Lib and the nun want to know if they have been blessed by some godly miracle or duped by a cruel fraud. The town’s reputation is at stake, as tourists and journalists flock to the area to venerate the saintly, enigmatic Anna. Readers will never forget this charismatic child. Donoghue claims Anna as her own invention, but the character is clearly inspired by many tales of so-called “fasting girls” throughout the western world between the 16th and 20th centuries. Some were found to be frauds, some died, some resumed eating, and others lived for decades claiming to need no food. For her part, Lib is unconvinced that such lengthy fasts are possible, even with divine intervention. Lib puts her faith in science, not religion. She constantly scours Anna’s room for secret stashes of food. Surely, the girl must be feeding herself, and not just on the invisible manna Anna claims that God provides. Lib is a magnificent heroine, although she seems at times impossibly modern and independent for an era in which women were meant to be silent, pregnant, and in the kitchen. She is smart, tenacious, outspoken, and unafraid to challenge authority, including the all-powerful Irish Catholic church. But there are also mysteries in Lib’s past, concerning a marriage and the death of a daughter, that may be colouring her perceptions. Lib and Anna are both haunted. Lib is a lapsed Protestant unfamiliar with the rituals – what she considers hocus-pocus – of the Catholic church. She is horrified when she learns the pain Anna is suffering: her other nurse, the devout and obedient Sister Michael, claims the girl is dying from “the kiss of Jesus.” Lib sees little difference between Ireland’s Catholic beliefs and the country’s many superstitions regarding “the little people” or fairies. 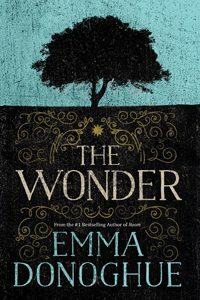 The church in The Wonder is depicted as authoritarian, irrational, and mean-spirited, enslaving the Irish to the same degree as political dictators the world over. God, says Lib at one point, is “the real tyrant in this part of the world.” Luckily, for Donoghue, the Catholic church dropped the Index Librorum Prohibitorum – its list of banned books – in 1966, or The Wonder would surely be on it. Much of the action in the novel takes place in Anna’s small bedroom, as Lib tries to expunge the religious forces that hold sway over the girl. In essence, the nurse tries to exorcize Anna – not of the devil, but of God. The discussions between the nurse and the child make one think of William Peter Blatty’s The Exorcist, except without the head spinning, pea-soup vomit, or violence. In their place, Donoghue provides scene upon scene of intricate mental fencing between nurse and patient, non-believer and Christian. The mysteries are solved in a series of shocking revelations toward the end of the book, in which we learn how Anna has been sustaining herself and why she wants to starve to death. Some of the events stretch credulity: the author’s manipulations are too evident. These are minor blemishes on an otherwise fascinating book that will surely mesmerize readers.